When you hear the name Marvel attached to a project it doesn’t only have to mean action, it will soon be synonymous with comedy, as well. 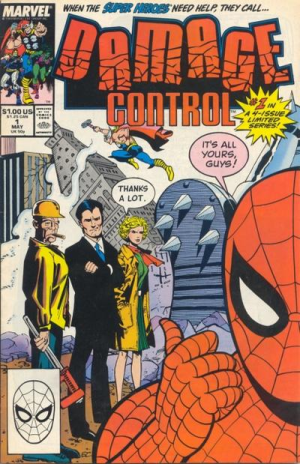 ‘Damage Control‘ will take it’s place on ABC besides ‘Marvel’s Agents of S.H.I.E.L.D.‘ and ‘Agent Carter‘. Marvel’s ‘Damage Control‘ centers on the overworked and underpaid cleanup crew of the Marvel Universe. Their specialty is dealing with the aftermath of the unique fallout from the superhero conflicts, like returning lost ray guns to their rightful owners, rescheduling a wedding venue after it has been vaporized in a battle or even tracking down a missing prize African parrot that’s been turned to stone or goo. Sometimes the most important heroes are the ones behind the scenes. It’s based on the comic of the same name which debuted in 1989. Ben Karlin (‘The Daily Show‘, ‘Modern Family‘) has developed the project and will exec produce with David Miner (‘Brooklyn Nine-Nine‘) and Marvel’s head of television, Jeph Loeb (‘Jessica Jones‘, ‘Daredevil‘). This entry was posted on Monday, October 5th, 2015 at 2:25 pm	and is filed under Comics, News, Television. You can follow any responses to this entry through the RSS 2.0 feed. You can skip to the end and leave a response. Pinging is currently not allowed. « WWE: Wrestlemania 32 Tickets Go On Sale…..